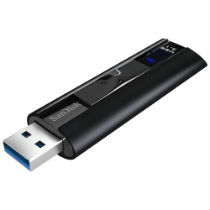 The SanDisk Extreme PRO USB 3.1 Solid State Flash Drive delivers super-fast solid state performance in a USB flash drive. A game-changer in the USB storage category, this flash drive offers read speeds of up to 420MB/s and write speeds of up to 380MB/s(1) that let you transfer everything fast. With capacities up to 256GB(*), there’s plenty of room to easily manage massive files. The sophisticated aluminum design is both stylish and durable, and the included SanDisk SecureAccess software, with 128-bit file encryption and password protection, ensures that your private files stay private(4). Plus, the SanDisk Extreme PRO USB 3.1 Solid State Flash Drive is backed by a limited lifetime warranty(6) for added peace of mind. Blazing-fast performance lets you transfer a full-length 4K movie to drive in less than 15 seconds(2) or 1000 photos in less than 25 seconds(3). The SanDisk Extreme PRO USB 3.1 Solid State Flash Drive delivers the performance, capacity, and reliability of an SSD in ultimate portability of a USB flash drive. The SanDisk Extreme PRO USB 3.1 Flash Drive features an elegant yet durable aluminum metal casing to help protect the drive from everyday wear and tear. The SanDisk Extreme USB 3.1 Solid State Flash Drive is backward-compatible, so you can plug it into any USB 2.0 or 3.0 port. 30 years in Germany, Canada and regions not recognizing "lifetime" warranty. See additional warranty information.